In private practice for over 35 years, Rhonda graduated from the Boulder College of Massage Therapy in 1982 where she went on to become a faculty member and clinic supervisor. She taught in several departments, but is most known for her canine and equine massage. This lead her down to Kentucky where she taught at the Lexington Healing Arts Academy. There, she served as Faculty Chair and developed and taught a 100-hour Equine Massage program. 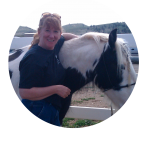 Rhonda also holds a Master’s degree in Psychology from Vermont College in Montpelier, VT. She is most known as the ‘go to’ person for animal massage in Boulder County.